Now that we have that out of the way let's talk about Newton's Nook! Today we are showing off the gorgeous new set Beautiful Wings. I love how intricate these flying beauties are! It reminded me of Zentangle designs so I decided to embrace that idea! I started by stamping the largest butterfly but only the wings. I created a border along the right hand side of my card. I didn't overlap them so no masking required! To fill in the gaps I used a copic safe black pen to draw diagonal lines. It added to the overall "doodling" look I was going for. I picked out a rainbow of copic markers to color the design. When you're blending different colors be careful to pick colors that have similar numbers. I tried to stick to the 02-04 range. There are exceptions to every rule though. For the BG I used a 45 which doesn't sound like it would work but it totally does. bottom line is try it out before you apply it your card :) Save yourself from frustration. After the colors were down I used some grays to add a shadow and then busted out the white gel pen. This let me add a bit more detail without taking away from the beautiful black outline. A strip of chevron paper down the opposite side was added for balance before I added my stamped panel using some craft foam. A few sequins finished it off! This is amazeballs gorgeous! The rich colors and white accents are fabulous! LOVE the use of the wings. The colors are fabulous. Absolutely gorgeous. Love the idea of adding doodling, and the shadowing really adds to the design. Love this design. Beautiful color choices. Stunning! I love the fun, vibrant border you created! Amazing colors on this gorgeous card! 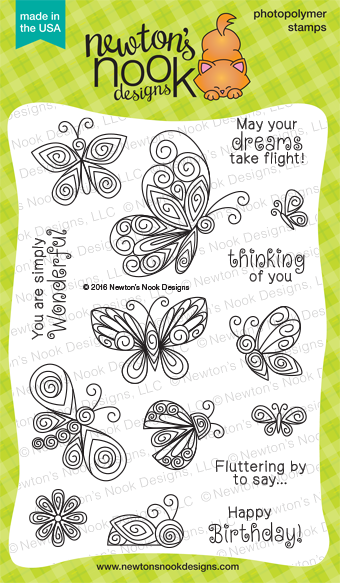 Stunning effect with this lovely butterfly stamp! I love it! Fabulous coloring and gel pen details! Great color selections and the blends are beautiful. This is awesome!! I LOVE the effect you did with the coloring. It totally looks like Zentangle!! This card is absolutely stunning! Love the bright, bold colors! You have a great eye for color and combination the white really makes it pop on the butterflies awesome job. Oh golly what pretty vibrant colors!! Love your design Kelly, this is so PRETTY!! What a beautiful card. The colors are stunning. Feast for the eyes! There is always a different magic in each and every creation, I am in rainbow heaven with awesome doodled border! Love the rainbow border effect. Very striking card. WOW - your rainbow of swirly butterflies is a DELIGHT ... you could say it is SIMPLY WONDERFUL but there is nothing simple about this WONDERFUL design, LOVE IT ALL!!! Brilliant use of these butterfly images, Kelly - and fantastic colouring, as usual! Such an interesting use of those butterflies, and so wonderfully colorful!! This is such a bright cheery card, love the butterflies. Wowwwww!!!! I love butterflies, this amazing release and this WONDERFUL card!!!!! Wow....this is one gorgeous card! What a cool way to use these butterflies and I love that bold color! Oh what a beautiful rainbow! Fabulous idea! !